SoulTrackers are likely familiar with James Day’s story, which began with his older siblings, parents and grandfather giving him a free music education that included the Jackson Five, Nat King Cole and Natalie Cole, just to name a few. Day took to the music and found inspiration in the sounds he heard coming from the radio during the 1980s. Day had designs on being a singer, dancer or perhaps a performer in musical theater, but a medical condition that affected his equilibrium and left him with bouts of dizziness derailed those dreams. The illness was a setback that became the setup for his comeback. Day ended up making his mark as a songwriter and producer in the mode of Quincy Jones and Norman Connors, recruiting highly regarded vocalists and musicians for a series of records that brim with dance floor tracks. 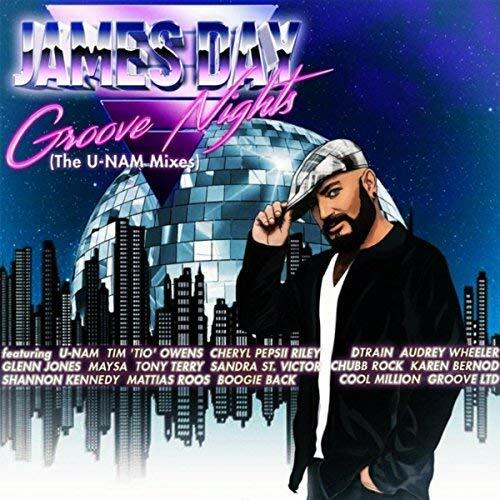 And he continues that trend with his latest, Groove Nights (The U-Nam Mixes). The Groove Nights lineup includes dance tracks by Audrey Wheeler, a New Jack Swing cut featuring Cheryl ‘Pepsi’ Riley, a sleek and synthy funk number that pairs James ‘D-Train’ Williams vocal with some blues/funk guitar work by U-Nam, and that’s just a sample. Riley falls right into the New Jack Swing feel on “Hurricane,” from her nod to Aaron Hall with the vocalese at the song’s start to her vocal delivery that packs a punch that complements Day’s percussive arrangement. Groove Nights’ highlights include “Love is My Bible,” “Speak Love” and “Who Can Tell the Heart,” a trio of cuts first heard on Day’s Song, Soul & Spirit album released in 2017, with each refitted with the 1980s sound, which is where this project finds its creative – if not thematic center. “Who Can Tell the Heart,” occupies that space where big and lush pop arrangements fused with soulful vocals and hints of jazz improvisation that turned 1980s tunes such as “Careless Whisper” into classics. However, “Who Can Tell the Heart” stands firmly in the current time by consciously fusing the personal and political, but when Tony Terry sings “you can tell your children what you think is wrong or right/you can tell the world what you believe/but who can tell the heart how it should feel/who tell the heart where it must go” it’s hard not to think of the political and cultural moment in which we find ourselves.